Just as i was preparing a blog post about all the wonderful places that you can visit for just 1 euro, around Nice. I walked down the street this morning only to notice, somebody reading the Nice Matin (local paper) with the following headline. I tried to get hold of my own paper, but the men and women who hand them out seem to have disappeared. So now i am back from my daily explore, i've logged on the the papers site to find out what its all about. Luckily google translate, is here to help me. 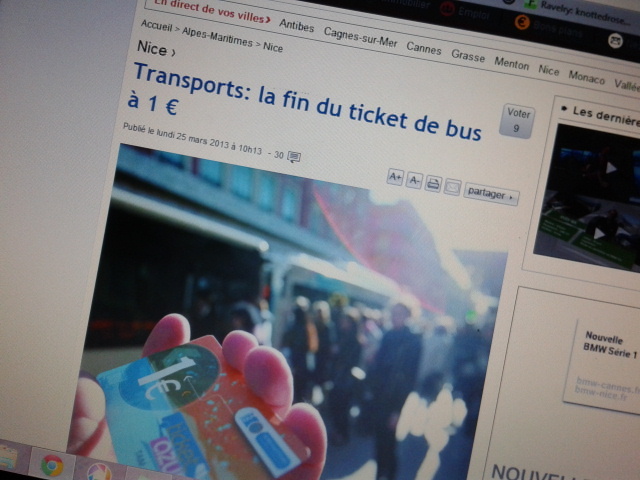 Nice and the surrounding area have had a flat rate of 1 euro bus and tram fares since 2007. A 1 euro bus ticket can get you from Nice to Eze, Monaco, Menton, Antibes, Cannes, Saint-Paul de Vance, Grasse, this list just goes on and on. They are amazing, and were one of the deciding factors for bringing me back to Nice. But like all good things with the current economic climate, they have to end. These bus fares are being funded by the local tax payers. The local council are due to vote on changes to the bus fares on the 29th and it is thought that the fares will go up to 1.50 euro in May. I'll be keeping my eyes open to see what they actually decide. Update: This was passed and the fares will go up on the 3rd of May 2013. 1.50 euros is still a bargain, but its not the headline grabbing bargain, that they once were. So if you are planning a trip to Nice and you are looking for a bargain, i would head this way before May 2013. Its a shame its going up, but definately still a bargin! I can't even get into the city for less than $2 and I only live a couple of kms out. Hope you are enjoying your time. Yes, definitely still a bargain, back home it costs me £4 to get into town and over £6 to get to the next. I am just now trying to research where else i can go on theses buses for the day. As I only have a few days left, but in truth i would love to just have a quite knitting day. Is that wrong?